What is a Sip & Paint class like at Art Studio 27? Art Studio Sip & Paint class is a place focused on helping new painters feel relaxed and comfortable in our space. Our main objective for our adult Sip & Paint classes it to provide a fun atmosphere and have our customers leave happy and inspired! An instructor paints one specific painting to all participants at one time. The class is taught step-by-step instruction with a brush and paint color. We provide canvas, easel, paints, brushes and aprons to protect your clothing. You are offered a beverage when you arrive after checking in. We have wine choices as well as soda if you do not drink alcohol. A typical Sip & Paint session is approximately 2 1/2 hours. What is the maximum number of painters in a class? What do I need to bring to a Sip and Paint class? You do not need to bring anything! We provide the canvas, easel, paints, brushes and aprons to protect clothing. *Please be aware we are painting with paints that do not wash off clothing. Can I bring my own wine/alcohol to a public Sip and Paint Class? Additional wine/ alcohol is not permitted in a “public” open class. If you are hosting a “private/reserved” event/class you are recommended to purchase a “Banquet Permit” online. When you provide the permit for the class, you then have the permission to bring additional alcohol beverages of your choice into the studio. Can I bring food/snacks to a class? Yes, we do not have any restrictions for this. Note there is not a whole lot of “extra” table space for large items along with the easel and painting supplies. You can sign up online and pay on our website by clicking on the calendar and the date you want to attend. You can also call the studio line and pay over the phone or let us know your name to pay in the studio the day of the event. Can I take my painting home after I paint it? Yes. We paint with acrylic paints and they are dry to the touch by the end of the class. We do not hold paintings in the studio, and recommend you take them with you. What are my options if I do not want to pay for a class online? You can call the studio line and purchase your space over the phone, or come by the studio and pay. Please call first to make sure the studio is open at the time you want to come by. I do not drink alcohol, is the cost of the class still the same? Yes. We provide nonalcoholic beverages. How can I book a Private/Reserved class? Private classes can be reserved by emailing us, or call the studio line with dates and times that you are interested in. We will get back to you as soon as we can to find a time and date that works for both of us. To book a private paint class, email or call the studio with dates/times that you are interested in. We check our instructor and studio(s) availability and schedule accordingly. Is a deposit due to reserve a class? Yes, private Sip and Paint classes require the host to pay their painting spot as the deposit. The cost of deposit is the cost of the class. Do you have gift cards for purchase? Yes, we have gift cards available for any value. They are provided in the studio for purchase. If I have a gift card how do I redeem it for a class or service? As of right now we require gift card redeemers to call and let us know that you are wanting to use your gift card for a specific class. What time do I need to arrive to a class? Please arrive to class on time. There is not a need to come any earlier than 10 minutes before. Do you have classes where you can come paint whatever you want? What ages are permitted? Yes. We offer “Open Studio.” Our monthly calendar will reflect the day or days when available. The ages will be stated on the event/class date. Can any age come paint at Family Night? We post the recommended age on the description of the class. Generally we recommend age Kindergarten and up. What if I like the Couples Paint Night Painting, Can I paint it alone? If this is something you are specifically inquiring about please contact us. How do I reserve a Kid’s Birthday Party? Please call the studio, or email us with dates and times you are interested in. We will get back to you with our availability to service you. What if I have never painted before or have little experience? We have amazing instructors who teach step by step each painting. We encourage an open mind and patience with yourself! We help you to trust yourself and relax and have fun! We ask that you give us 24 hour notice, or ASAP if you need to cancel your painting spot or private class. If you are unable to attend a class that you have paid for, and know that you want to try to come paint with us again on a different date, we offer a credit for another class in replace of a full refund. Please call to make arrangements. We will offer refunds to clients who contact us at communicate the situation. How many classes at a time can Art Studio 27, LLC accommodate? We currently have two studio spaces, and are able to fill them both at the same time if scheduled. 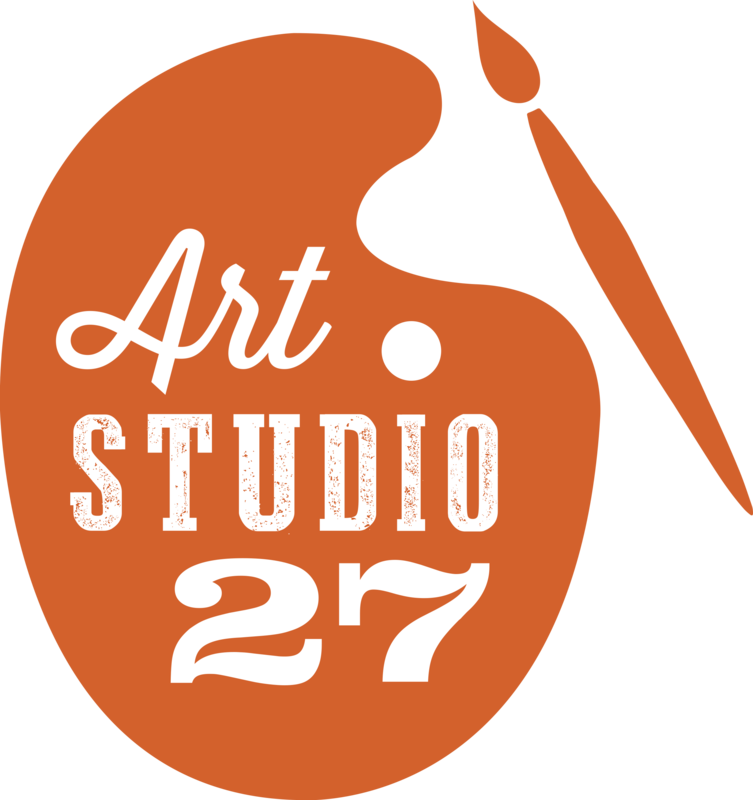 Is Art Studio 27 wheelchair accessible? Yes, we are able to accommodate most wheelchairs. *Our restrooms are very small and are not able to accommodate a chair on the inside. Does Art Studio 27 travel outside of your location? Yes we are working on travel package pricing. Please inquire within if you are interest. What is parking like at your studio? I have a full “Palette Punch Card” and my next class is free. How do I redeem it? Please call in advance to sign up for the class you are wanting to attend. Please bring the “Palette Punch Card” with you to the day of the class.